Teri stopped into our showroom simply looking for ideas. 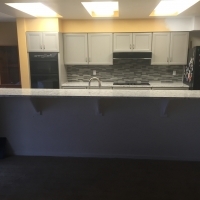 She knew she needed to update her kitchen, but didn't know where to start or even have any ideas about what she was looking for. 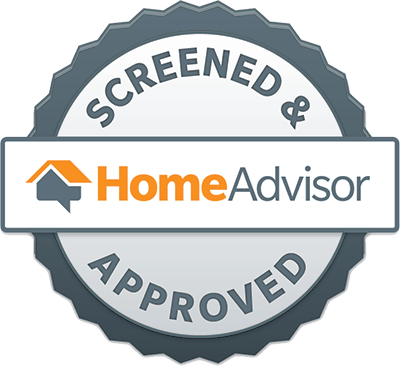 I gave her some basic information about our cabinets and let her browse our showroom. 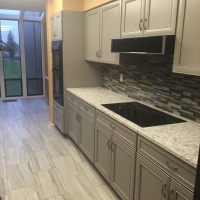 When she came across a sample door featuring our warm gray, semi transparent stain with dry brush accents, she fell in love. "This is the one I want" she said. "I don't want it now, but this is the one." I took down her information and made a note regarding the sample door. I gave her a call a couple weeks later just to check in and she stated she wouldn't be ready for another few months. I told her no hurry, just give me a call when you're ready. In the meantime I suggested that she start an idea book keeping notes and pictures about things she liked from other kitchens. 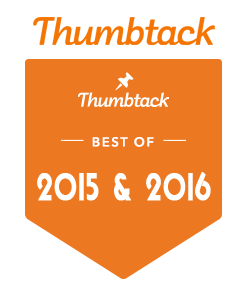 A year later, Teri came back into the showroom for her initial design consultation with her measurements and a binder full of magazine clippings. We spent a couple hours reviewing the cabinetry photos that she had collected and came up with a great cabinet layout. 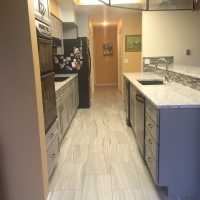 Because her galley kitchen was functional and she didn't have a huge budget to relocate appliances or move walls, we opted to keep an identical cabinet layout, put packed that layout with built in storage features. Teri was most excited to have soft close doors and drawers, which are a standard feature on all of our Yorktowne cabinet lines. 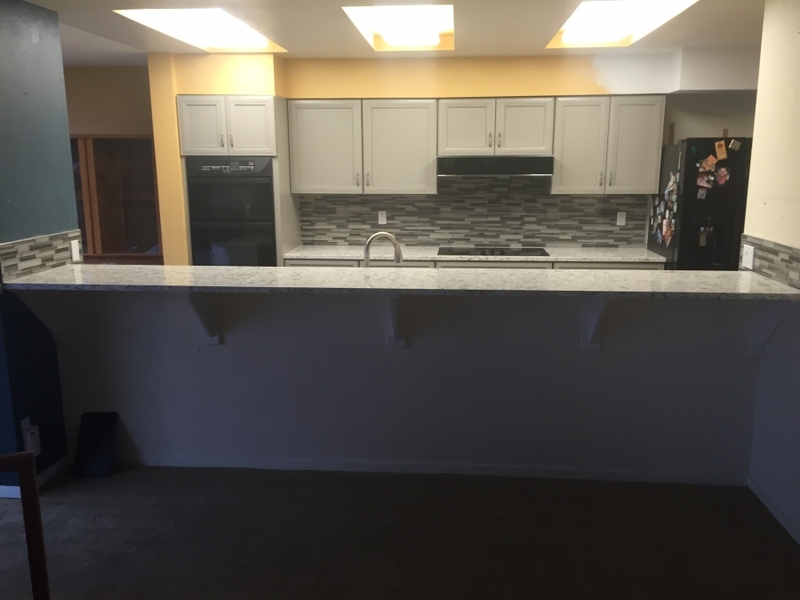 Teri lived in a retirement condominium community and her kitchen shared a wall with her neighbor's master bedroom. She always felt terrible for accidentally slamming the cabinet doors late at night while baking, which she did often. Because she was a late night baker, we added a maple bread board to one of the drawer bases, a tray divider cabinet above the built in oven, and several drawer dividers that helped keep her organized enough that when she needed a rolling pin or a whisk, she didn't have to rummage around an overstuffed drawer and risk waking her neighbors. We also added several large roll out shelves into the base cabinets, again so she wouldn't have to rustle pots and pans out of a tiny opening. The door that Teri initially fell in love with, is the same door she ended up using for her final selection. The Harbor Mist is from our coastal semi transparent stain collection that offers an option for a dry brush accent that enhances the character of the wood and gives the cabinetry a more lived in feel. The door style that she chose was the Vera Flat Panel in Maple. 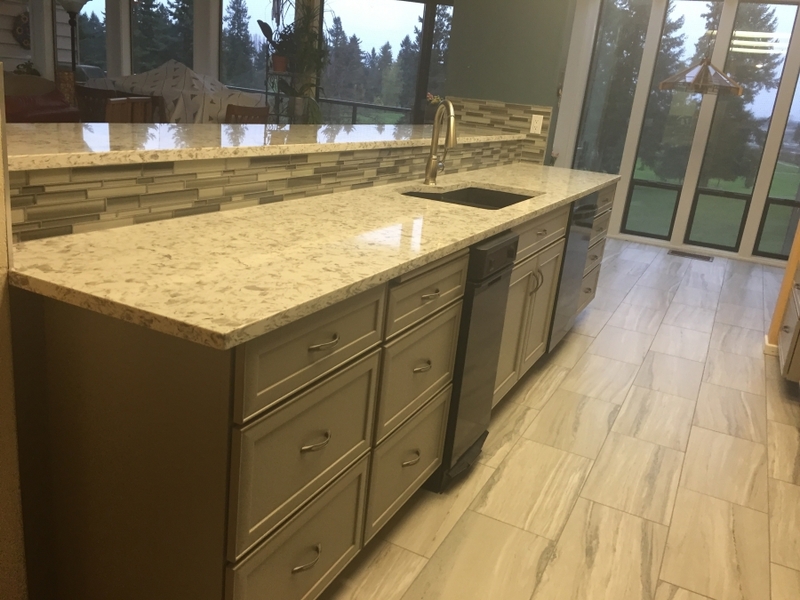 Like many people, Teri was having a hard time selecting a countertop from the large selection in our Tacoma Showroom (located at 2710 Yakima Ave Tacoma, WA 98409). Since we had an exact match sample door, Teri and I drove over to our suppliers slab warehouse in Fife, which is open to our customers, and combed the aisles of full size slabs until we found the perfect match. 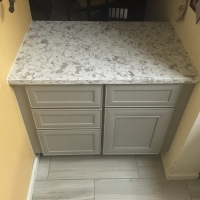 We placed a hold on the two slabs that we needed for her kitchen and had them delivered to our eco friendly countertop fabrication facility where we cut and polished them to the perfect fit. 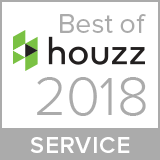 When HGTV came to Gig Harbro to remodel their 2018 Dream Home and needed the best quartz countertops in town, New Leaf Cabinets & Counters was their choice. 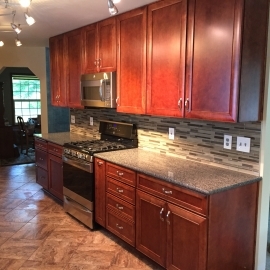 Take a look at the beautiful full height backsplash in the kitchen. 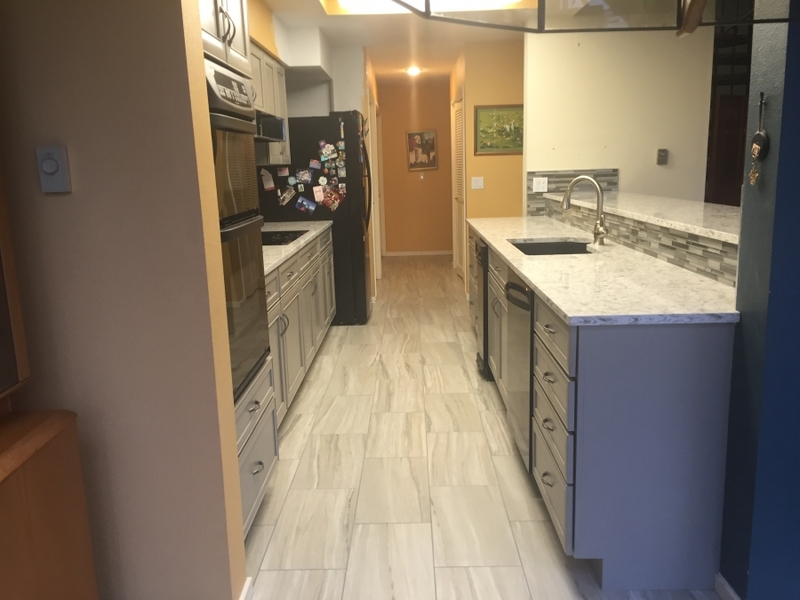 Another beautiful kitchen remodel in Tacoma in which a load bearing wall was removed to allow space for a new island. 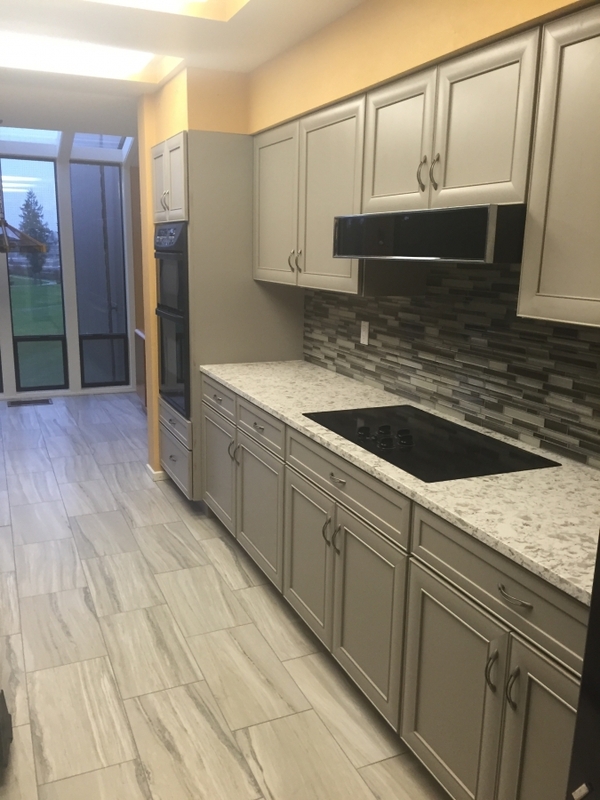 Key components: white cabinets, black quartz countertops, refinished hardwood floors, marble mosaic backsplash. 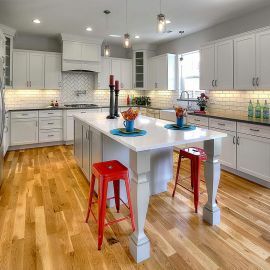 A stunning color combination that uses a gray "peppercorn" stain on the lower cabinets and our white icing paint on the uppers. The added pewter highlight really set it off! 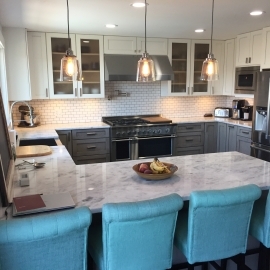 In this Tacoma kitchen remodel, we combined a formal dining room with the kitchen to create a large open concept kitchen with a breathtaking island. 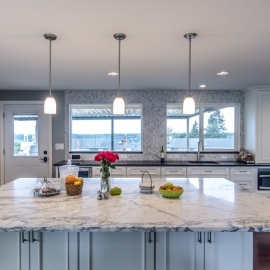 Key components: white carrera marble island, black granite countertops, white cabinets, marble backsplash. 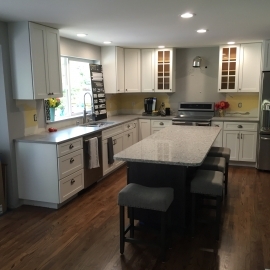 A very on trend kitchen remodel featuring white shaker cabinets with a gray stained island and quartz countertops. This kitchen design uses several unique custom cabinet creations to create both a wine and coffee bar. 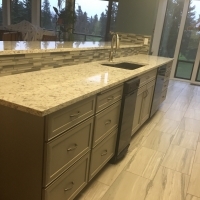 Built in cabinet storage was the key to this beautiful kitchen renovation in Gig Harbor, WA. 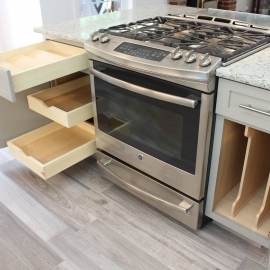 Features include a pull out spice rack, roll out shelves, spice drawer, a tray divider and much more. 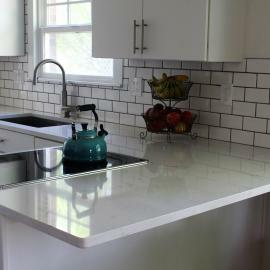 Rich maple cabinets and new quartz countertops really brought this galley kitchen back to life. 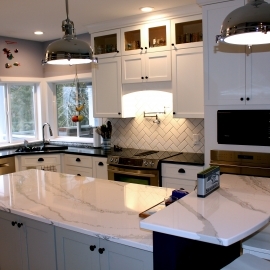 The beautiful Brittanicca Quartz island by Cambria really tied the white and gray cabinets together in this kitchen. 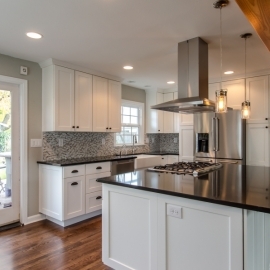 This new custom home features a kitchen fully designed by New Leaf Cabinets & Counters. 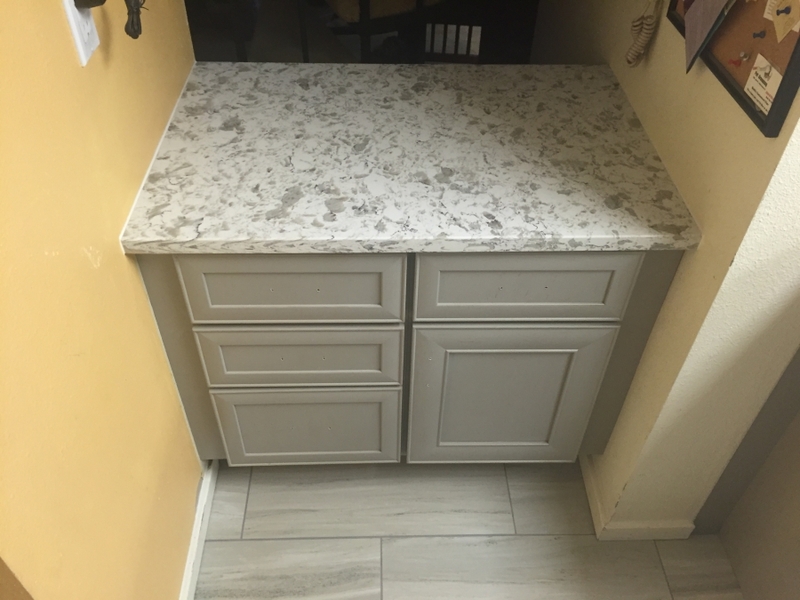 Storage features include a blind corner pull out, roll out pantry shelves, and contrasting white and gray cabinets and countertops.